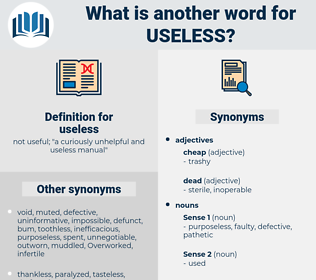 What is another word for useless? not useful; " a curiously unhelpful and useless manual"
worthless, futile, meaningless, fruitless, unusable, unhelpful, needless, unserviceable, ineffectual, pointless. 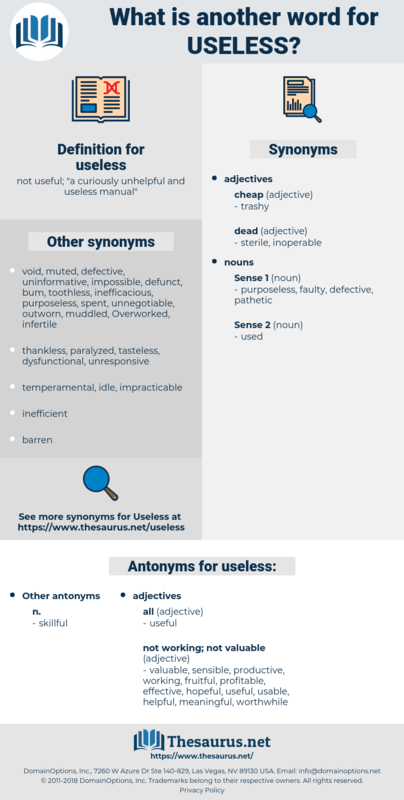 useful, wasteful, helpless, irrelevant, inoperable, hopeless, counterproductive, nonsensical, sterile, impractical, unworkable, invalid, helpful, meaningful, inappropriate, feasible, inefficient, frivolous, toothless, obsolete, worthwhile, good-for-nothing, lame, absurd, idle, nil, lousy, null, unwarranted, incapable, avoidable, inoperative, gratuitous, unwanted, undue, ridiculous, terrible, incompetent, zero, Non-existent, extraneous, mindless. senseless, ineffective, vain, unproductive, superfluous, unsuccessful. valuable, productive, meaningful, fruitful, profitable, usable, effective, helpful, sensible, worthwhile, hopeful, working. substantial, worthy, sound, valid, real, powerful, expedient, advantageous, beneficial, solid. It will be useless and will only lead to your early death, a thing I should regret. It would, as she knew, have been useless, as the Duke had declared that he would see no one except his eldest nephew, his nephew's wife, and Madame Goesler.